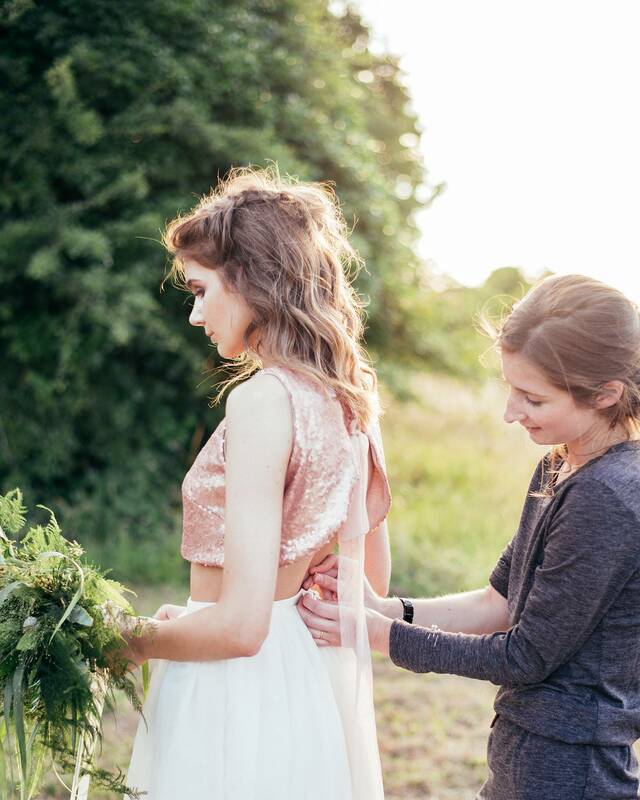 I am always flexible to my clients needs and budgets in producing their bespoke dress, from the initial measuring right through to the final fitting I endeavour to make the process as simple and stress free as possible. My process is simple; bring along your ideas, images or swatches. If you don’t have any don’t worry, I have all of the latest silks and fabrics to hand in my studio. We will then work together to choose the perfect material for your special day allowing you to be as hands on or hands off as you would like to be throughout the entire process. I always allow enough time in the schedule to have as many fittings as you need so your dress fits you perfectly with the flexibility to refine as we go. This results in a completely unique and utterly beautiful. Net cape with Guipure lace trim. Hawaiian print shirt dress with frill sleeves and buttons down the front. Custom Flip Sequin Kimono Style Jacket with Short Sleeves. Satin and chiffon Christening gown made from a wedding dress. Stretch Satin emerald green wrap over style dress.